I have had a number of long term customers ask me why GO BOX Storage isn't hiring more staff. They can see we are tired and overworked. I can't really answer that question without talking about business profitability and the hard facts-of-life in "the market". Many people find business profitability a bit of a mystery because most modern workers are completely disconnected from their personal productivity. Here are just some of the facts. GO BOX has never increased the prices of our core services since opening in 2007. Our delivery price has not changed, nor has the price of our heated warehouse storage increased. Actually, we have reduced our price of storage by offering cheaper forms of storage — unheated warehouse storage and your site storage. We also offer deep discounts for customers that pre-pay for storage. During this same time, the government has had a policy of inflating the monetary supply. GO BOX has not raised our prices with inflation, so customers are still paying for service today in 2007 dollars. If you believe the official inflation rates, the average yearly inflation is about 1.7% or 11.9% over the past seven years. 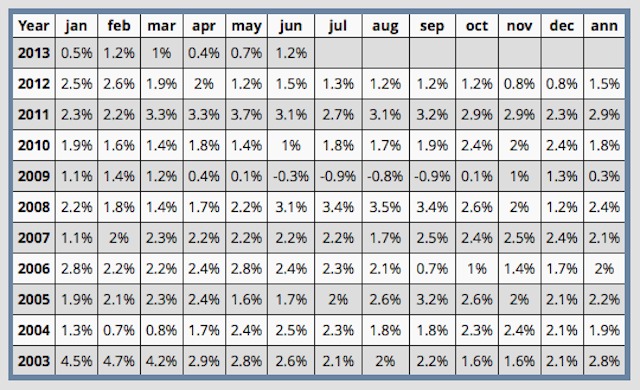 Here are some inflation numbers for Canada. Take these numbers with a big dose of skepticism. Our biggest increase in productivity was upgrading our crane delivery truck to a self-loading forklift delivery truck. I'm not kidding when I say it takes half the time to do twice the work. We have also streamlined every business system down to a lean-mean-business-machine. There is very little waste in our business system. The GO BOX Permaculture Project even produces a substantial portion of our household food, while living where we work reduces our expenses even more. Our biggest decrease in expenses was by reducing delivery days from four to three days a week. By reducing delivery days by 1/4 we have been able to maximize truck use efficiency even while the cost of fuel has been steadily increasing. We also reduced office hours from six to five days a week. By doing so we eliminated the need for a second shift of workers. This action very much improved the bottom line. The cost of fuel has been steadily increasing. If you look at the fuel the inflation rate is closer to 5% each year. This rate of inflation seems closer to the true situation. I would like to say that I would really like to be able to have a second shift and afford to hire two workers. Shaen and I are often overworked and very tired. We can't even get sick because there is no one to replace us. Unfortunately, the market will not bear the costs of those two additional workers. The market is just too cost sensitive. Maybe the market will turn around and demand will increase enough to pay for the extra workers, but until those days come, there will be no extra job development at GO BOX. I find this situation very sad because I know there are young people that want to work and want to be given a start. This same situation is playing out all over the city, province and country. As GO BOX pays $15,000 in property tax — which would go a long way to paying for one worker — I can't help but wonder how I would spend the money if it wasn't being liberated by the government for their consumption. We just have to hope the government will spend my productivity more frugally than I would. "For it is the nature of inflation to give birth to a thousand illusions... Inflation is the opium on the people." One more point about the rate of inflation and the message government gives to business through its macroeconomic policies. Right now, our wonderful governments are in a game of inflating the monetary supply so it may seem like there is growth, but it may be just smoke and mirrors. By inflating the monetary supply any true productivity in society is being consumed by the state. All the time the state is liberating from productive citizens, people are thinking the state is doing them a favour by spending money. Are we saving money for tomorrow's consumption? Are we spending everything we have for today's consumption? Are we going into debt for today's consumption? If you are saving money, your microbusiness or household economy is in a surplus, so you are "growing". Your microbusiness or household growth can be liberated by the state if the state inflates the money supply. If you are spending everything you earn for today's consumption you are at zero growth and very vulnerable to the state inflating the money supply. Even standing still, you are losing your standard-of-living when the money supply is growing because your dollar tomorrow will not buy what it bought today. If you're going into debt for today's consumption your microbusiness or household is on borrowed time and will soon implode. What is the "true" rate of inflation? How much does my microbusiness or household need to "save" just to keep pace with the government's policy of inflating the monetary supply? Are there any actions my microbusiness or household can take to stop the state from liberating my savings and consuming my productivity? SOS TIP:GO BOX Storage is working hard to keep prices reasonable while improving quality. If you would like to help us keep prices low, give yourself extra time for your move. Unplanned stuff happens. Please be patient and keep to your planned delivery schedule. Extra trips and special treatment will, in the end, increase costs for everyone. SOS TIP:It's always tempting to get special treatment, but try to avoid asking government to do anything for your special interest group. "The market" provides for your "voluntary" needs. Governments take your productivity through taxation for their own needs. Governments may release tiny amounts of funding for your special interest group but it's a tiny fraction of your original productivity. In the end, society becomes impoverished by government interventions. ** There is another way a business can make a go-of-it without increasing productivity or reducing costs. This business lobbies government to make legislative change that favors that business, thus becoming a protectorate of government through outright grants, monopolies, tariffs, parity pricing and the like. Updated August 5, 2013: I have been reading The Mirage of Inflation an essay from Economics In One Lesson by Henry Hazlitt. Hazlitt sees inflation as "tantamount to a flat sales tax of the same percentage on all commodities, with the rate as high on bread and milk as on diamonds and furs. Or it might be thought of as equivalent to a flat tax of the same percentage, without exemptions, on everyone's income. It is a tax not only on every individual's expenditures, but on his savings account and life insurance. It is in fact, a flat capital levy, without exemptions, in which the poor man pays as high a percentage as the rich man." In its later days, inflation gets even worse: "Inflation acts to determine the individual and business policies we are all forced to follow. It discourages all prudence and thrift. It encourages squandering, gambling, reckless waste of all kinds. It often makes it more profitable to speculate than to produce. It tears apart the whole fabric of stable economic relationships. Its inexcusable injustices drive men toward desperate remedies. It plants the seeds of fascism and communism. It leads men to demand totalitarian control. It ends invariably in bitter disillusion and collapse."